Voltacon’s recessed lights are strong and durable, which means they’re suitable for installation in almost all commercial and residential buildings – including airports, shopping centres, and residential structures. Due to the use of a high-quality solid aluminium heat sink with no plastic parts, these LED round panels have an edge over the competition. They have a tougher, sturdier feel as they’re 10-15% heavier than other recessed lights but still produce a streamlined look when installed as they’re incredibly slim. With a round shape and recessed finish, their sleek look will suit any home. 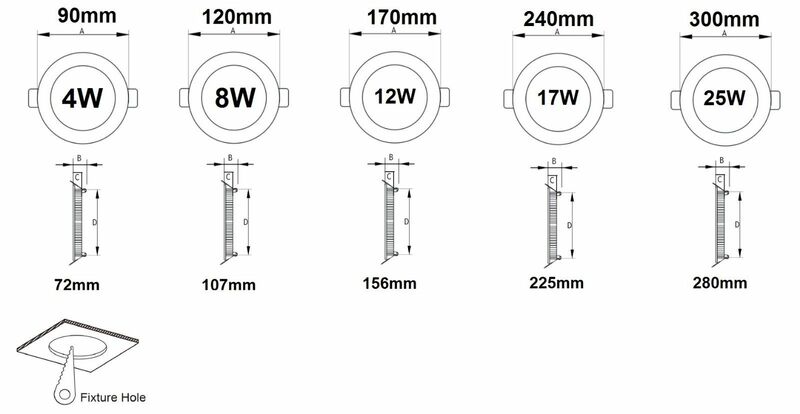 The lights are supplied with fittings for easy installation and can be mounted on varied materials for extra versatility, including concrete roofs, suspended ceilings, and wooden surfaces. The model can also be dimmed for full control over the atmosphere of your space. Find out why our LED panels are the right choice. Visit our Blog to convince yourself of our quality. Click here to go to the article we prepared for you. These recessed lighting solutions from Voltacon are also more technologically advanced than rival products. They are the latest replacements for old-fashioned halogen and fluorescent PLG24 round downlighters, which are less environmentally friendly than these newer products. The use of LED in these recessed lights, which have a low heat output, significantly reduces energy bills. Voltacon’s recessed lights come with a 5-year warranty for guaranteed peace of mind. They’re also safety certified for added reassurance. Omikron Recessed LED Panel 4 inches, with Dimmable Options and Three Colour Temperatures. Recessed LED Panel Ceiling Light IP54, with Dimmable Options and Three Colour Temperatures. Emergency Battery Pack. 3 hours maintained power supply. Compatible with LED round panels.